She waited nervously while rescuers helped them out. 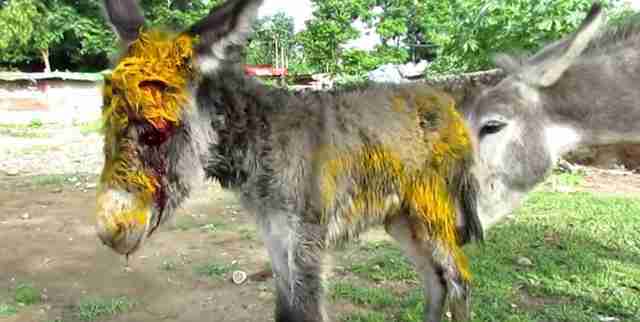 Some people in the area had noticed the little donkey's injuries and tried to help by covering her in turmeric powder, which they thought would stop the bleeding, but it wasn't enough. The donkey's mother had no idea what to do and kept nuzzling and prodding her, desperate to help. ... and so they took her along, too. ... and her mom stayed nearby the entire time. After a while, she seemed to understand that these people were trying to save her baby, and she was no longer afraid. The baby's wounds were severe, but with lots of love and attention, she finally began to heal, and miraculously, made a full recovery. Her rescuers named her Genevieve, and love watching her run and play with confidence now that she's all better - with her mom always close by, of course.